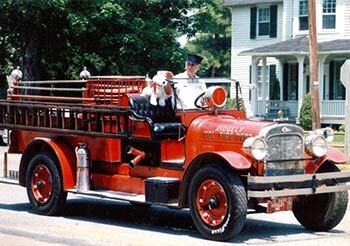 The Ridgely Volunteer Fire Department was organized in 1905, one year after the town’s water works were installed and only nine years after the town was incorporated. This was the period offoot-powered" hose carts, when the wail of the basket factory whistle would alert the firemen throughout the town and bring them on the run, pulling the carts behind them. With the brand new water pipes, the system pressure was good and considerable water could be thrown without the use of pumps. The Company was incorporated in 1926 when the 1st fire engine was purchased. A Ladies Auxiliary was organized around 1948 and has proved to be a great asset to the Company.